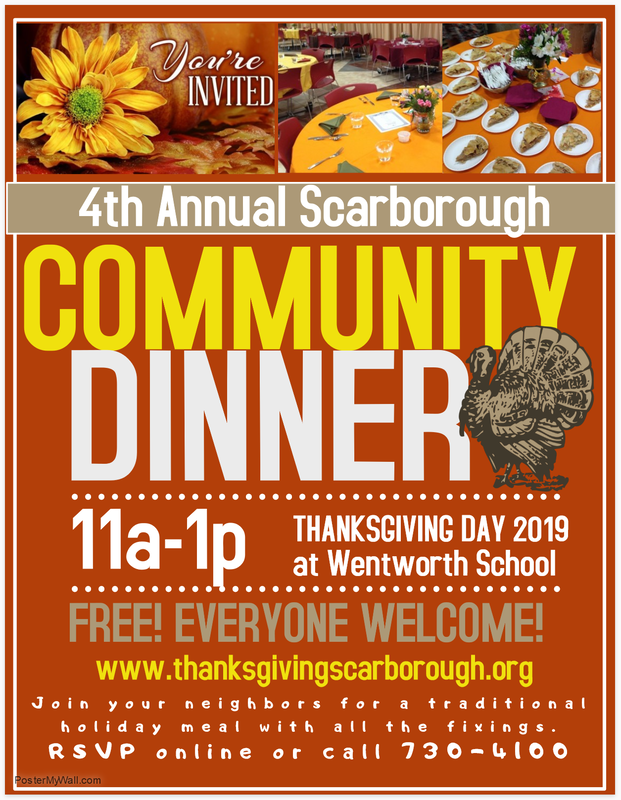 Thanksgiving Scarborough is a free community meal hosted by Scarborough School Nutrition Program, Scarborough Community Services, Project GRACE, Scarborough Garden Club, and many neighbors and friends in Scarborough. All are welcome to attend. A traditional Thanksgiving meal with all the fixings: Roast Turkey, Stuffing, Mashed Potatoes, Carrots, Green Bean Casserole, Cranberry Sauce, Gravy, Rolls. Coffee, Milk, Cider. Apple & Pumpkin Pies. Need a ride? Community Services will pick you up! Just let us know you when you rsvp. Anyone! Everyone! Invite your friends and family! All are welcome! So that we can make plenty of turkey with all the fixings, please click to RSVP or call 730-4100 to reserve your seat at the table. I WANT TO HELP - HOW DO I GET INVOLVED? I WANT TO GIVE - HOW DO I MAKE A DONATION? Contact Project GRACE at 883-5111 or click the button to give online today. Thank you!